3 Easy Ways to Grow Your Following — Organically! If you aren't already involved in an engagement group, you NEED to join one right now! Luckily you don't have to search too far...we have our own Facebook group where you can connect with other bloggers and brands. It's completely free to join and so incredibly helpful if you are running a blog/business. Not only is it a great way to get your name out there, but it's the perfect place for networking opportunities where you can form REAL relationships with other inspiring ladies. We love to see your growth, so each week we post threads where you can promote your different platforms or brands. If this interests you, click here to join our #galgang. Now this next tip is so simple + easy because all you have to do is be authentically YOU. If you want to have a successful brand, the best thing you can do is find your niche and stick with it. Consistency is key and this includes staying consistent with your brand. Don't be afraid to ask yourself what you stand for and what type of audience you want to reach. 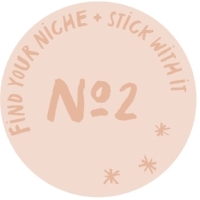 This is so important for growth because once you find your niche, you can connect with other bloggers and brands within that realm. Not only will this help you grow as a brand, but you will be much happier knowing that you're promoting content that you truly believe in. This goes hand in hand with tip #1, but we truly can't stress this enough. It's called social media for a reason...to be social and ENGAGE with your followers! The smallest things seriously make such a difference; for example, simply by commenting back, or returning the favor with a nice comment can seriously make someone's day. When you start to actually engage with your followers, you will notice a HUGE difference in the amount of feedback you get yourself. They say treat people the way you want to be treated, so go ahead and give out those likes and comments because they will be kindly reciprocated. Not only does this tip go for your own followers, but also for people that you look up to, such as famous influencers or brands. You never know who is going to take notice so it's super important to engage and be present on your platform.